Have you been saying, “I’m just aging,” or “It’s my old age,” as an excuse for impaired mental agility and brain health? Although as we age, our brains do lose stigma, there are several ways to stay young at heart and keep our brains challenged every day. Our cognitive skills are very important, especially as we get older, because we are not always stimulating each skill every day. The definition of the word cognitive means, the process of knowing and includes all of the following skills: reasoning, awareness, perception, knowledge, intuition, and judgment. These cognitive skills are our main focus for boosting our seniors mental agility and brain health. 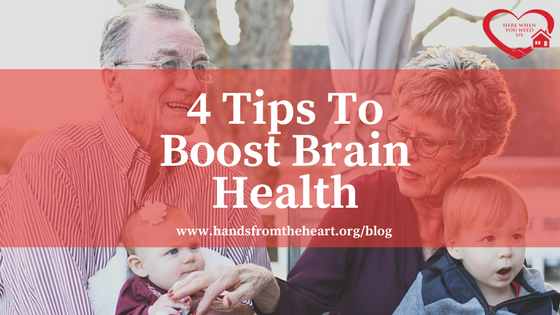 The following list is 4 tips that we came up with for our clients to boost their brain health and continue to challenge their brains with the help of their loved ones and caregivers. Learn a new trade or skill. As we age, we often lose the excitement of learning something new. According to health scientists and several doctors, who have done extensive research into brain health and agility, learning a new skill and exercising your brain in a new way is the best way to strengthen brain health. Pick up a trade or skill like woodworking, crocheting, or writing in a diary every 6 months to keep your brain excited for new information. Play games with others. Interaction is necessary for seniors to stimulate a part of their brain that may not be used on a day-to-day basis and it allows for a feeling of greater self-worth. Playing games with a caregiver, grandchild, or companion helps keep our brains functioning at its highest level with games such as cards games, puzzles, checkers, or board games that challenge our minds. Join a group or class. Having an exciting schedule helps us to look forward into the future. There are several programs that our organization offers such as Health Galas that incorporate mental agility opportunities including art classes, live music, and interactive presentations. You can also view community programs and classes at your local library or senior center that will provide you with new opportunities that you may not have thought of before. Volunteering. Getting out of the house helps seniors feel connected to the world and all age groups. There are numerous organizations that would be happy to bring anyone on board to help volunteer with their programs such as the United Way or American Red Cross. The satisfaction of helping other people will help fill a void in the brain or heart. You can help out local organizations or expand your network and find something you can do from the warmth of your own home. Hands From The Heart is continuously empowering our clients to better their health by encouraging them to exercise, eat healthy, and enjoy a cup of laughter every day with their caregivers. For more health tips and information on our home healthcare services, call us at: 844-6-HomeNow or follow us on social media @HandsFromTheHeart on Facebook, Twitter, Instagram & LinkedIn.